Recently I wanted to make a salad for a get together that was different than your typical green salad. I settled on a base of roasted peppers, tomatoes, and mozzarella cheese. It turned out great! It was fresh and light but still very satisfying. I know you can buy jarred peppers that are already roasted and peeled but I think they have a bitter taste so I like to roast my own. I rest the peppers on a cookie sheet lined with foil and place the cookie sheet under the broiler. Be sure to watch them closely! I turn the peppers until all sides are blackened. Remove the peppers from the oven and place in a bowl. Cover the bowl with a plate so that the peppers can steam. Once they have cooled you can easily peel off the blackened skin and remove the stem and seeds. The Perfect Pairing for this salad is fresh mozzarella pearls. The fresh mozzarella pearls are great because they are the perfect size for the salad. You can definitely use regular fresh mozzarella and cut it to size, but why not go the easy route? Slice the roasted peppers into bite-sized pieces. 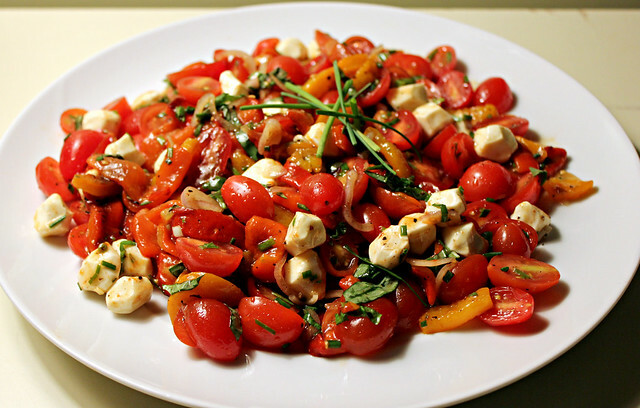 In a large bowl combine the peppers, tomatoes, shallot, herbs, and mozzarella cheese. In a small bowl combine the dressing ingredients and whisk to combine. Taste for seasoning and adjust to your tastes. Carefully stir the dressing into the salad, serve immediately. *Rest the peppers on a cookie sheet lined with foil and place the cookie sheet under the broiler. Be sure to watch them closely! Turn the peppers until all sides are blackened. Remove the peppers from the oven and place in a bowl. Cover the bowl with a plate so that the peppers can steam. Once they have cooled you can easily peel off the blackened skin and remove the stem and seeds.